SAM Learning’s company mission and David Jaffa’s personal mission (David is the Founder and C.E.O. of SAM Learning) is to provide a launchpad for career and life for young people. In this video David talks about mission and purpose in education and how this effects the daily work of school leaders as well as education partners and suppliers such as SAM Learning. 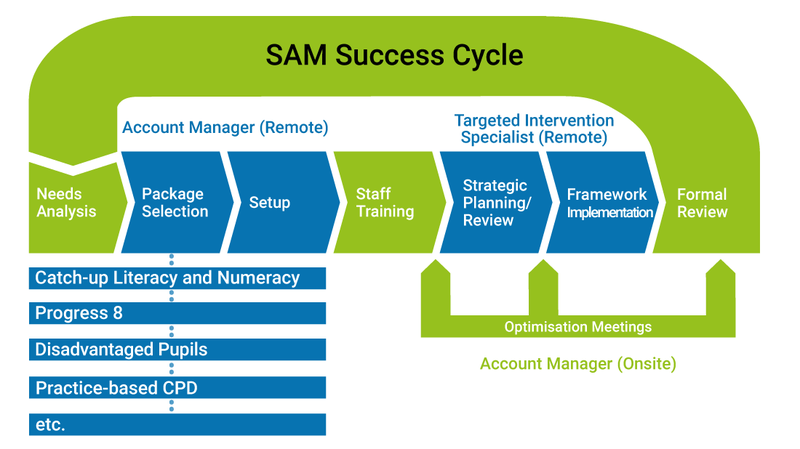 SAM Learning fulfils this mission by providing a series of proven intervention solutions for schools that are delivered through the SAM Success Cycle, explained below. The SAM Success Cycle is a proven approach to ensuring success and optimum return on your investment with us. This process covers all components from Needs Analysis to Training to a formal Subscription Review. We are passionate to ensure SAM Learning is a huge success in every school and to enable us to achieve this we hold one telephone meeting per term with each SAM Learning school, three telephone meetings over the academic year. We refer to these meetings as Optimisation Meetings which are conducted by former Headteacher Damien Keogh and / or former Deputy Headteacher David Brown. Damien and / or David will guide you through a structured agenda lasting approximately 20 / 30 minutes to ensure your SAM Learning subscription is delivering the outcomes you require and is perfectly aligned with your School Development Plan and priorities.